Knowing intimately that the borderlands are a place of learning and growth, Robyn draws on their identity and heritage as a queer Latin@ in everything that they do. From doubt to divine and everywhere in between, their call as an activist-theologian demands the vision to disrupt hegemony and colonialist structures of multi-layered oppression. 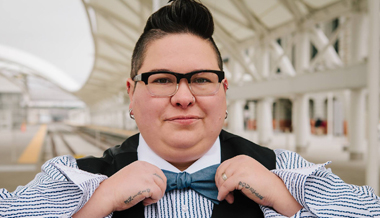 As an anti-oppression, anti-racist, non-binary Trans*gressive Latin@, Robyn takes seriously their call as an activist theologian and ethicist to bridge together theories and practices that result in communities responding to pressing social concerns. Robyn sees this work as a life-orienting vocation, deeply committed to translating theory to practice, and embedded in re-imagining our moral horizon to one which privileges a politics of radical difference. Robyn on radical bridging and collective liberation.